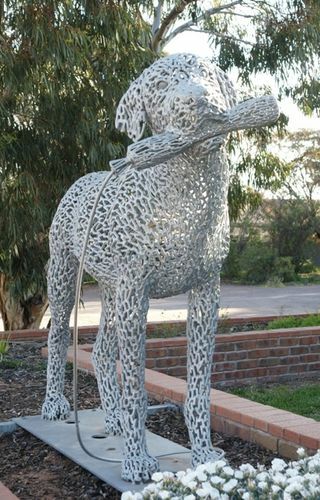 The Loaded Dog statue is based on the dog, Tommy, from Henry Lawson`s famous Australian story called "The Loaded Dog" . The story was chosen because it fulfilled all the specifications for the statue at a veterinary clinic. The dog is a spectacular steel sculpture about the size of a small horse and was sculpted by the world famous sculptor Andy Scott in Glasgow, Scotland using his unique technique of wielding of thousands of tiny pieces of steel rod to create iconic street art. The story revolves around a mischievous Labrador Retriever dog who picks up an explosive charge, jumps through the camp fire lighting the fuse and the chaos that follows when his owners, Andy and Dave, try to get the explosive charge back before it detonates.